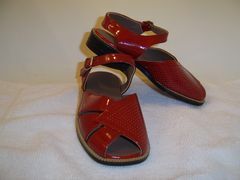 On this page you can see the photos of Kids Dress Shoes and Children's Sandals designed and made by my Dad Lermont back in the mid-1970's. 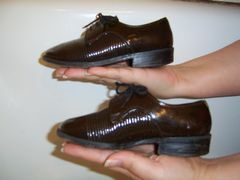 He made these shoes for my brother Albert when he was three years old. The photo on the right was taken by our Mom when my brother Albert was eight years old. They were in their Hotel room in Yerevan, Armenia. Our parents and Albert had taken a two-week vacation to visit our relatives. 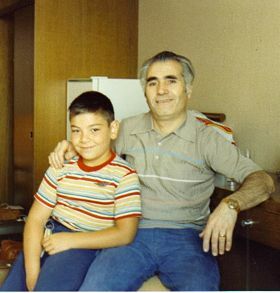 As you can see in the next photo Albert is much older and so is my Dad. That's because this photo was taken years later. My two brothers and I never wore shoes bought from a store until we moved to the United States from Armenia. My Dad designed and made all our shoes-for me, for my two brothers, for my Mom, and for himself. All our school friends and neighborhood children were jealous of us because our shoes always stood out and looked much nicer than theirs. Of course! 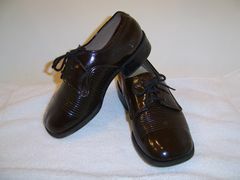 That's because we always wore custom designed and handmade shoes made by my Dad Lermont. Now Albert and his wife Julie have a newborn son who can wear the same shoes in a couple of years. 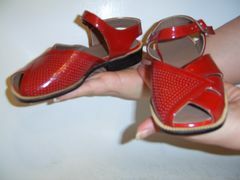 The same shoes that his Daddy used to wear, designed and made by his Grandfather Lermont. Looking at these photos it's hard to tell that these kids dress shoes and kids sandals were made so long ago, and that they were used almost on a daily basis. It is amazing how good these shoes still look after all these years! I can easily credit that to my Dad's high quality work. This is a clear proof of my Dad's excellent skills and talents. We all are so proud of my Dad Lermont. 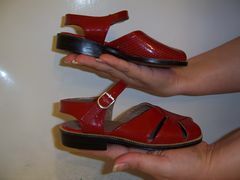 I am holding those kids dress shoes and kids sandals in my hands so you can see how small they are. And I don't have big hands. After we moved to the United States he stopped designing and making kids dress shoes and kids sandals because he got into the shoe repair business and has been working in that field since the 1970's. When it comes to shoe repair, my Dad Lermont is unique because of his skills and ability of not only designing and making kids dress shoes, children's designer shoes, children's sandals, but also men's and women's custom shoes. Therefore, he can handle even the most difficult repair requests that other shoe repairmen usually would refuse. 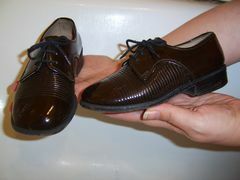 Feel free to check out my custom shoes designed and made by my Dad Lermont back in the 1970's that I still wear. 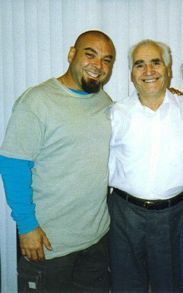 My Dad Lermont is your #1 shoe repair expert in the Los Angeles area! You don't have to take my word for it. His customers saw it for themselves. You can also read what a few of his customers said about my Dad on the shoe repair expert home page. His shoe repair shop was convenient to visit if you lived in the Foothill Boulevard area, in Tujunga, La Crescenta, La Canada Flintridge, Pasadena, Verdugo Hills or Glendale. Some of his customers drove all the way from Burbank, Van Nuys, Hollywood, West Los Angeles and Beverly Hills. After visiting him, the majority of his customers agreed with me that Lermont was #1 shoe repair expert in the Los Angeles area.